The publications of Eske Willerslev exhibit a pattern of attempting to suppress the true history of the European race. In this paper Willerslev and his associates declared that the Anzick 1 genome “refutes the possibility that Clovis originated via a European (Solutrean) migration to the Americas”, which is complete nonsense. In this post I exposed the questionable nature of the association between the Anzick 1 remains and Clovis artifacts, which Willerslev’s paper sweeps under the rug, and I showed that his paper gives an incorrect time range for the Clovis period, so that he could claim that the Anzick 1 remains date to that period, when in fact they date to after that period. In this paper Willerslev and his associate Carlos Bustamante committed an act of outright fraud in order make the world believe that the people of the Chachapoya civilization of pre-Columbian Peru were entirely Amerindian. In this post I presented incontrovertible evidence that at least some of the people of that civilization were White. The post includes links to photographs of Chachapoya human remains with obviously European, rather than Amerindian hair. Willerslev and Bustamante made sure that DNA results from such remains did not appear in their paper. Willerslev has continued his anti-White propaganda efforts in this paper on Easter Islanders. 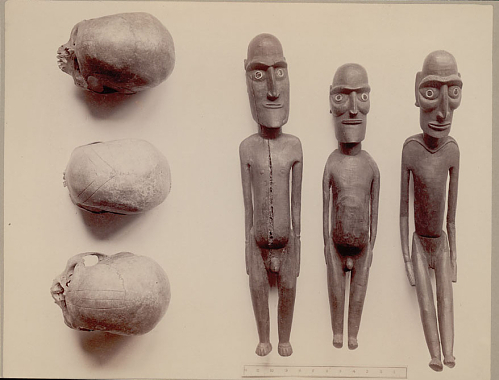 Earlier analysis of samples from Easter Islanders had showed the presence in those samples of Amerindian HLA alleles, European HLA alleles, and Y haplogroup R1b STR values. The new paper from Willerslev used SNP data from the same samples analyzed previously to estimate that an admixture event involving Amerindians occurred 20.4 generations ago, which is before the modern European exploration of the Pacific, and that an admixture event involving Europeans occurred 3.2 generations ago. But nowhere in Willerslev’s paper is there any mention of the overwhelming, indisputable, and glaring evidence that White people were among the original inhabitants of Easter Island. His paper gives the impression that the European admixture found in the samples is accounted for entirely by the recent European presence on the island, when in fact only part of it is. The other part, as I will show, is from the island’s original White inhabitants. In the early morning we looked out and could see from some distance that they had prostrated themselves towards the rising sun and had kindled some hundreds of fires, which probably betokened a morning oblation to their gods. We thereupon got ready to effect a landing, but just then our former visitor came on board together with many others of his people, bringing us a quantity of dressed fowls and roots. One amongst these was an entirely white man, who was wearing white chocks of wood in his ears as large as one’s fist, and bore a very devout appearance, so that we took him to be an idol priest. As for their complexion they are brownish, about the hue of a Spaniard, yet one finds some among them of a darker shade and others quite white, and no less also a few of a reddish tint as if somewhat severely tanned by the sun. The brown skin color described by Behrens is typical for the Taiwanese-Melanesian hybrids that now populate Polynesia. The red skin color indicates an Amerindian element in the population, while the white skin color indicates a European element in the population. 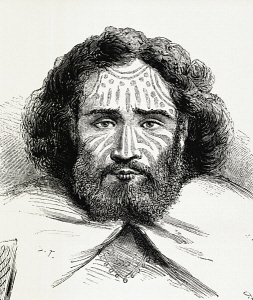 Their physiognomy does not resemble that of the Indians of the Continent of Chile, Peru, or New Spain in anything, these islanders being in colour between white, swarthy, and reddish, not thick lipped nor flat nosed, the hair chestnut coloured and limp, some have it black, and others tending to red or a cinnamon tint. The same hair colors seen among the Easter Island natives by the Spanish are found in the mummies of ancient Peru and Chile. 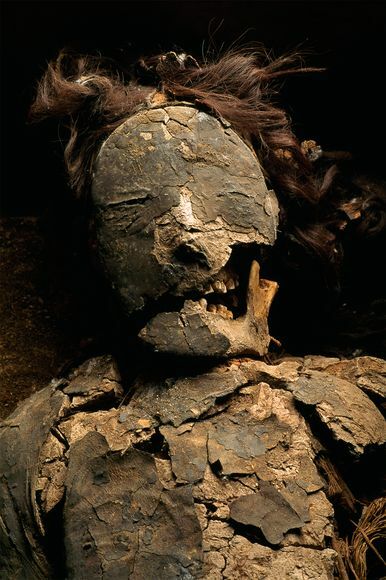 Some of the Chinchorro mummies, which are many thousands of years old, had chestnut-colored hair. Red or cinnamon-colored hair can be seen in the mummies of the Nazca culture at the Chauchilla Cemetery, and it can also be seen in remains from the Chachapoya civilization at the Laguna de los Cóndores site. To this day red hair is found among the descendants of the Chachapoyas, and genetic testing has showed that their red hair is of European origin. The third group of Europeans to visit Easter Island were the British, led by Captain James Cook, in 1774. 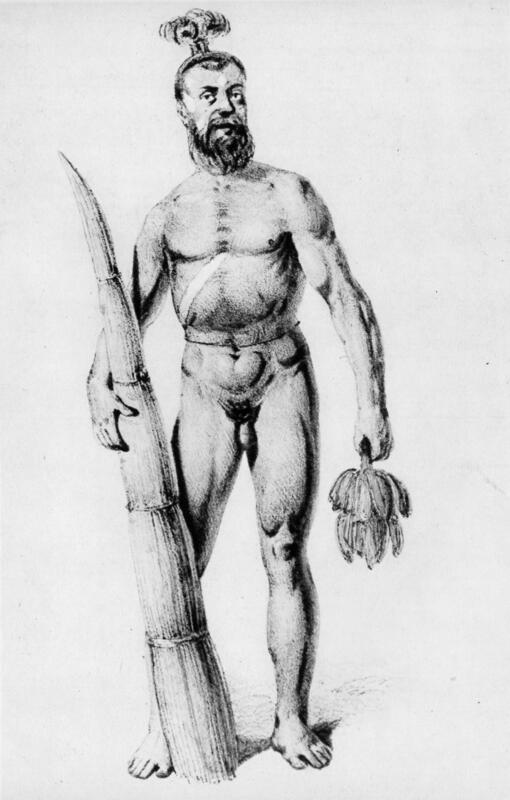 Below are drawings of an Easter Island man and woman made by William Hodges, the artist for the Cook expedition. These natives look nothing like the Taiwanese-Melanesian hybrids of Polynesia, but instead look like Europeans. Note that the man has a beard, and that they both have elongated earlobes. 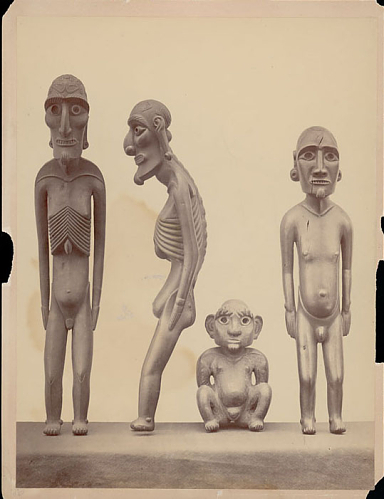 Below are drawings of an Easter Island man and woman made by Abel Aubert Dupetit Thouars during his visit to the island in 1838. They both look like Europeans, and not at all like Taiwanese-Melanesian hybrids. Note that the man has a topknot and a full beard. The giant moai statues on Easter Island, shown below, also look nothing like the Taiwanese-Melanesian hybrids of Polynesia. They also look like Europeans. These statues were monuments erected to the memory of the natives’ ariki, or kings. 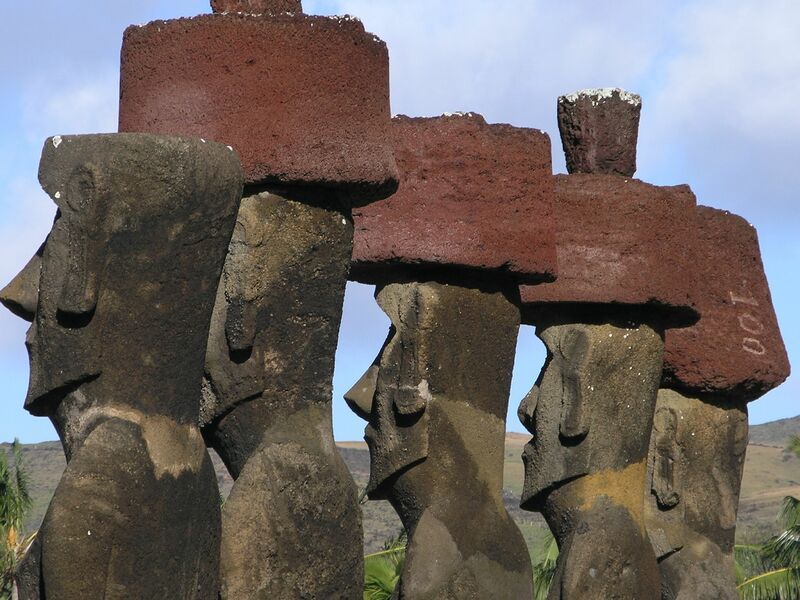 The natives went to the opposite end of the island from the quarry where the statues themselves were carved to obtain the red rock for the cylindrical pukao, or topknots, that were placed on top of the moai. These red topknots represented the red hair of the kings of Easter Island. Below is the moai head that is on display at the Louvre. This head is obviously that of a European man and not that of a Taiwanese-Melanesian hybrid. In my post on the Chachapoyas I pointed out the similarity between the moai and the large Chachapoya sarcophagi at Karijia, shown below. 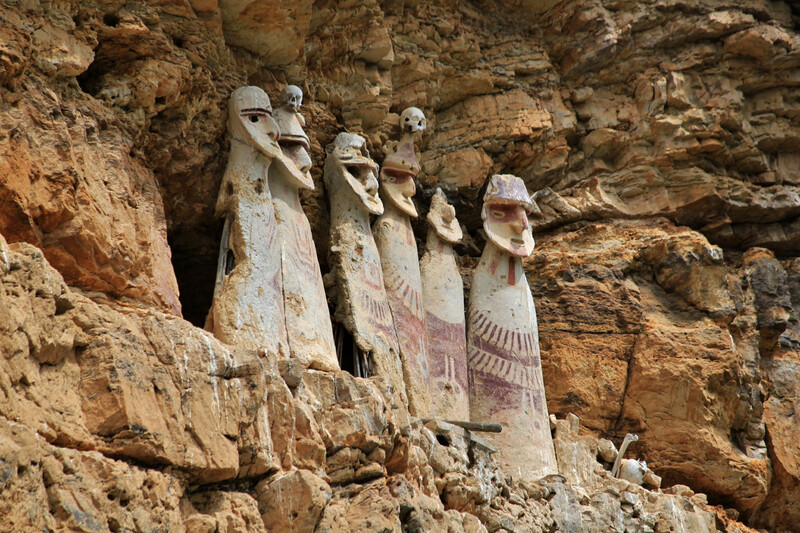 I’ve since come across the next two photographs of stone heads from Easter Island, which strongly resemble the heads of the Chachapoya sarcophagi. In both cases the heads look like Europeans, rather than Amerindians or Taiwanese-Melanesian hybrids. 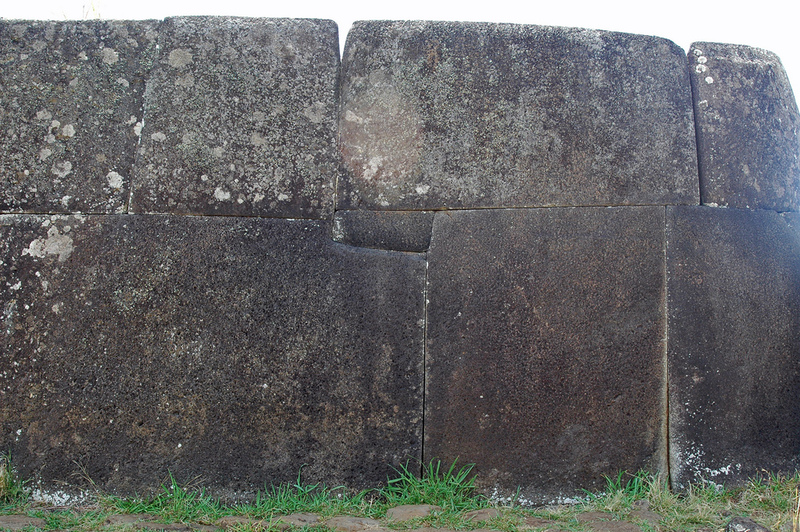 The other large stone artifacts found on Easter Island aside from the moai are the ahu, or stone platforms, on which many of the moai stood. The most impressive ahu still remaining is the one at Vinapu, in the southwest of the island. As the photograph below shows, the ahu at Vinapu is made of huge blocks of basalt that were precision-cut and perfectly fitted together. Basalt is a very hard volcanic rock, harder than copper, iron, and steel, and yet the blocks at Vinapu were cut like they were blocks of cheese. This kind of precision stonework is not found anywhere in the Polynesian islands to the west of Easter Island. It is only found to the east, at Andean sites like Saksaywaman, Ollantaytambo, Machu Picchu, Sillustani, Tiwanaku, and Wari. The largest river near the city is called Viñaque, near which there are some great and very ancient edifices, which are now in ruins, but appear to have stood for many ages. When the Indians are asked who built these ancient monuments, they reply that a bearded and white people like ourselves were the builders, who came to these parts many ages before the Yncas began to reign, and formed a settlement here. I asked the natives, in presence of Juan de Varagas (who holds them in encomienda), whether these edifices were built in the time of the Yncas, and they laughed at the question, affirming that they were made before the Yncas ever reigned, but that they could not say who made them. They added that they had heard from their fathers that all we saw was done in one night. From this, and from the fact that they also speak of bearded men on the island of Titicaca, and of others who built the edifice of Vinaque, it may, perhaps, be inferred that, before the Yncas reigned, there was an intelligent race who came from some unknown part, and who did these things. Being few, and the natives many, they may all have been killed in the wars. They also relate what I have written in the first part, namely, that there were people with beards, in the Island of Titicaca, in past ages, white like ourselves; that, coming from the valley of Coquimbo, their captain, who was named Cari, arrived at the place where Chucuito now stands, whence, after having founded some new settlements, he passed over with his people to the island. He made such war upon the inhabitants that he killed them all. In ancient time, they say, the country and province of Peru was in darkness, having never light or day. There were, at the time, certain people in it, which people had a certain chief who commanded them and to whom they were subjected. Of the name of the people and the chief who commanded them they have no recollection. And in those times, when all was night in this land, they say, that from a lake in this country of Peru, in the province of Collasuyo, there came a chief called Con Ticci Viracocha who, they say, had with him a certain number of people, which number they do not recollect. And after he had sallied from this lake he went from there to a site that is close to this lake, where to-day is a village called Tiahuanaco, in the aforesaid province of the Collao. And as he went thither, he and his own, forthwith there improvisedly, they say, that he made the sun and day, and ordered the sun to move in the course it now moves and afterwards, they say, he made the stars and the moon. And upon leaving orders as to how they should produce the orejones when he was gone, he continued further, while doing his works. And when he arrived in the province of Puerto Viejo, he joined up in that place with his own people whom he had sent out beforehand in the manner I have described earlier. As they assembled in that place, he placed himself on the ocean together with them, wherefore it is said that he and his own people went on the water just as if they were walking on land. 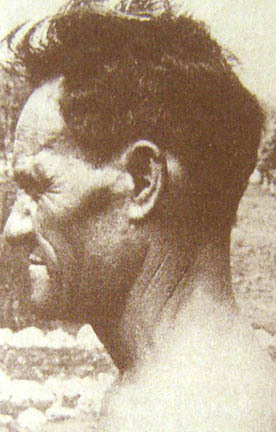 The “orejones” referred to above were the long ears of the light-skinned elite of ancient Peru, which were produced by artificially elongating the earlobes. While the history given by the native Peruvians tells of their god Viracocha traveling out into the Pacific, in the direction of Polynesia, the history of the Easter Islanders tells of their earliest ancestor and first king, Hotu Matua, coming to Easter Island from the east, in the direction of South America. The history of the Easter Islanders was inscribed on wooden tablets in the island’s rongo-rongo script. Like the precision stonework at Vinapu, writing was not found on any of the Polynesian islands to the west of Easter Island, but only to the east, in the high-culture areas of the Americas. The best-known writing system of the Americas is that of the Maya, and according to Maya history it was their bearded creator god and culture hero Itzamna who invented their system of writing. The Cuna Indians of Panama and Colombia had a form of writing that in some ways resembled the writing of Easter Island. Both were carved on wooden tablets, both were written in boustrophedon, with alternate lines going in opposite directions, and both were written starting at the bottom of the tablet and going to the top. There is also evidence that forms of writing once existed in Peru, but that they were later lost. The 16th century writings of Cristoval de Molina and Pedro Sarmiento de Gamboa both mention that the Incas had their histories painted with figures on large boards, and that these boards were kept in a place called the House of the Sun. The 17th century writings of Fernando Montesinos, which are at least in part based on the lost 16th century writings of Blas Valera, mention that the pre-Inca civilizations had a system of writing, but that it was lost as a result of great wars that took place long before the Incas came to power. It was said that this pre-Inca writing was done on the leaves of the plantain tree, which is very significant, because Easter Islanders being taught to write rongo-rongo would first learn by writing on banana leaves, before writing on wooden tablets. It is even thought that the surface of the rongo-rongo tablets was made to resemble the surface of banana leaves, as the height of the lines of writing corresponds to the distance between the veins on the leaves of the banana tree. The native traditions in regard to the incised tablets simply assert that Hotu-Matua, the first king, possessed the knowledge of this written language, and brought with him to the island sixty-seven tablets containing allegories, traditions, genealogical tables, and proverbs relating to the land from which he had migrated. A knowledge of the written characters was confined to the royal family, the chiefs of the six districts into which the island was divided, sons of those chiefs, and certain priests or teachers, but the people were assembled at Anekena Bay once each year to hear all of the tablets read. The feast of the tablets was regarded as their most important fete day, and not even war was allowed to interfere with it. The history on the tablets was recited to Thomson by Ure Vaeiko, one of the native elders on the island. Ure Vaeiko was apparently not able to actually read the characters on the tablets, but had instead memorized the entire text associated with each tablet, so that when he was presented with a particular tablet he could recite the corresponding text. In order to test the veracity of Ure Vaeiko’s recitations, Thomson later presented the same tablets to another elder, Kaitae, who recited exactly the same texts as those given by Ure Vaeiko. Hotu-Matua and his followers came from a group of islands lying towards the rising sun, and the name of the land was Marae-toe-hau, the literal meaning of which is “the burial place.” In this land, the climate was so intensely hot that the people sometimes died from the effects of the heat, and at certain seasons plants and growing things were scorched and shriveled up by the burning sun. Note that the Easter Island word fenua, which was translated in the above as “group of islands”, actually can refer to any land, regardless of size. The above description is a perfect description of Peru, which, from Easter Island, lies towards the rising sun. The climate described matches that of the desert areas along the Peruvian coastline. And the name “the burial place” couldn’t be more appropriate for Peru, which is filled with the ancient mummified remains of a brown, chestnut, red, and blond-haired people. According to the history recited by the elders to Thomson, there had been 57 generations of kings since the time of the first king, Hotu Matua. 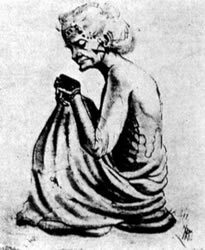 Assuming 25 years to a generation, Hotu Matua would have lived 1,425 years before 1886, or around 450 AD. Willerslev cites this paper claiming that Easter Island was uninhabited until 1200 AD, and this paper claiming that almost all of the other islands of Polynesia, including Hawaii, New Zealand, and the Marquesas, were also uninhabited until 1200 AD. There are, in fact, hundreds of radiocarbon-dated samples from across Polynesia that antedate 1200 AD. The Norwegian expedition to Easter Island in 1955–56 led by Thor Heyerdahl found pieces of charcoal at Poike Ditch that were dated to 386 AD. A charcoal sample from South Point on Hawaii was dated to 290 AD. The authors of the papers cited by Willerslev simply dismiss all of these pre-1200 datings as being “unreliable”. This is reminiscent of the way that “Clovis First” academics would always find one reason or another to dismiss anything found in the Americas antedating the Clovis culture. The claim that Easter Island was first colonized around 1200 AD was disputed by the papers here, here, and here, and also by the book review here. The paper here on core sample data from Rano Kau crater on Easter Island shows that there was a decline of palm forest and a great increase of charcoal fragments starting around 100 AD. This abrupt change was likely the result of the arrival of humans on the island. 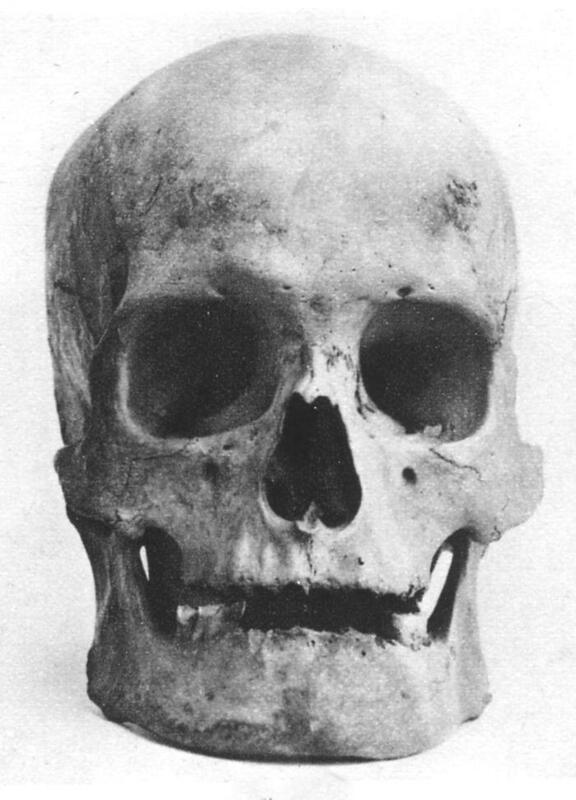 Below is a photograph of the skull of a Taiwanese-Melanesian hybrid from the Marquesas Islands. The skull’s brachycephaly indicates that the Taiwanese element is phenotypically predominant in this particular individual. The next two photographs are the front and side views of a Caucasoid skull from Easter Island. 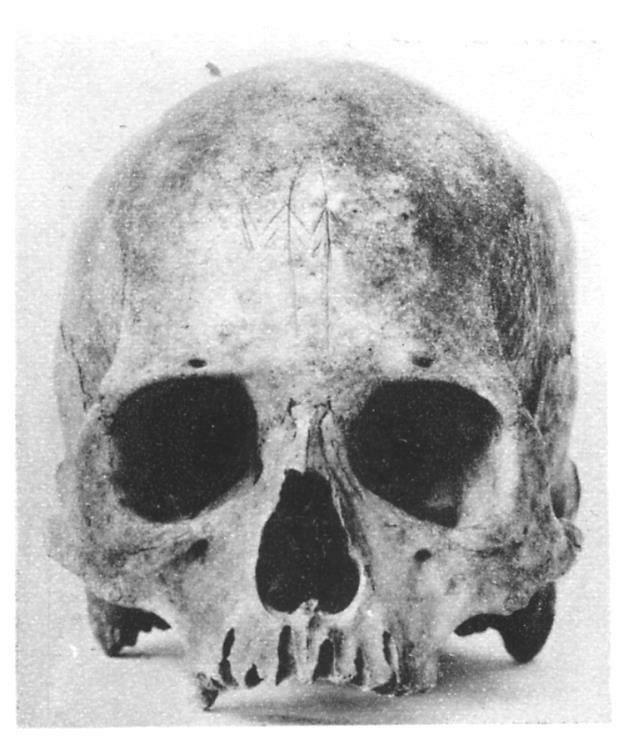 In the front view, note that the skull has a narrow nasal aperture, which is a characteristic of Caucasoid skulls. 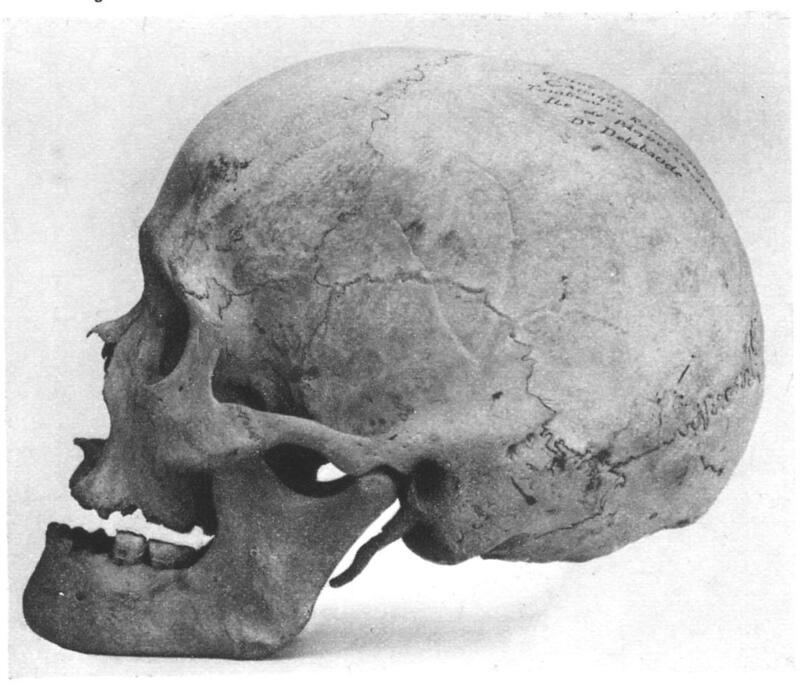 In the side view, note the high, projecting nasal bone, which is another characteristic of Caucasoid skulls. Below the photographs is an illustration of, on the left, a typical European skull, and, on the right, a typical Taiwanese-Melanesian hybrid skull. 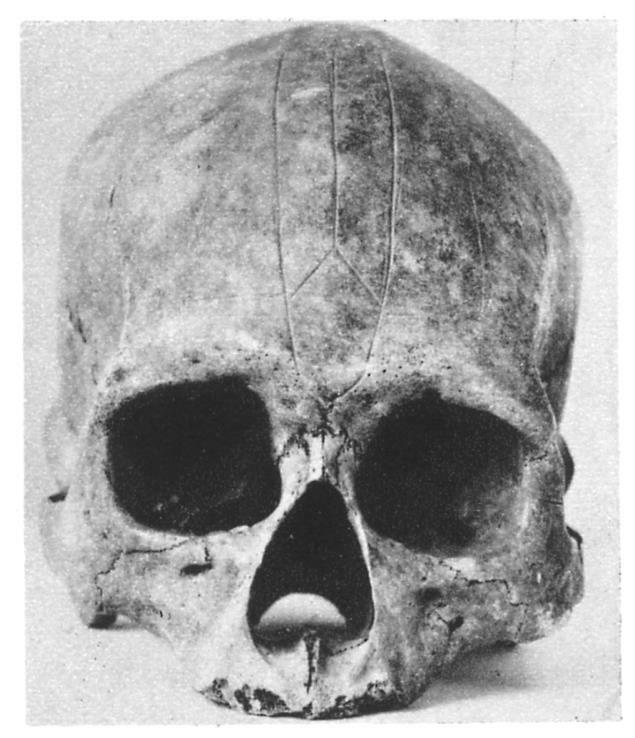 The most distinctive feature of Taiwanese-Melanesian hybrid skulls is the continuous convex curve of the bottom part of the jaw. Because of this curve, when the jaw is placed by itself on a flat surface it makes contact at only two points, and it therefore rocks when disturbed. This form of jaw is thus known as a “rocker jaw”. 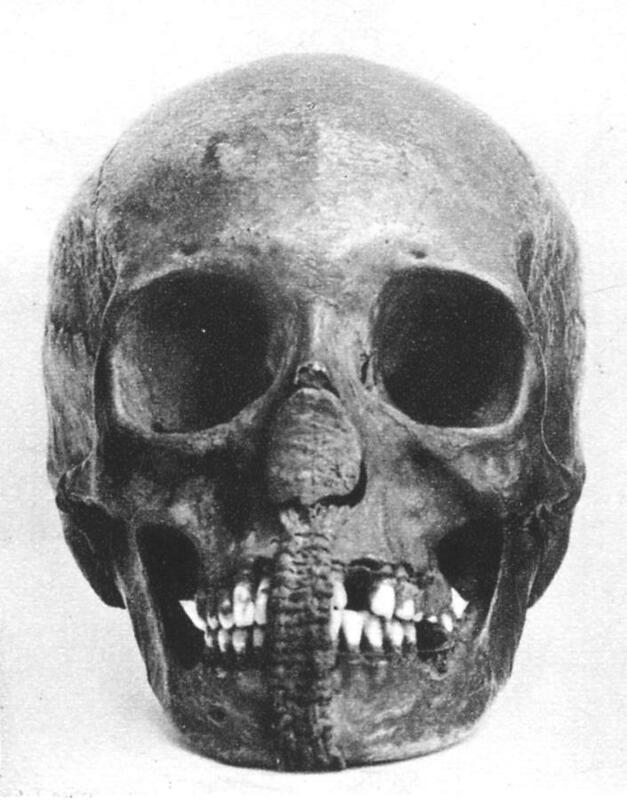 Note from the side view of the Easter Island skull that the bottom of the jaw is flat, not curved. It rests stably on the underlying surface, and would not rock if disturbed. The Caucasoid skull from Easter Island obviously looks nothing like the Taiwanese-Melanesian hybrid skull from the Marquesas Islands. The idea found in many mainstream narratives that Easter Island was populated entirely by Taiwanese-Melanesian hybrids from the Marquesas is therefore obviously wrong. 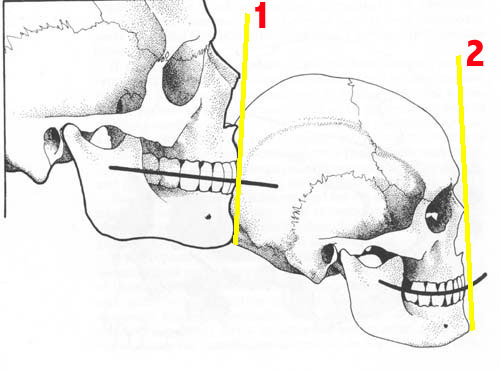 Below the front and side views of the Easter Island skull are front and side views of the Cro-Magnon 1 skull. The similarity between the two skulls is remarkable. The wide jaw seen in both of these skulls can also be seen in the fifth photograph below, which is of a Chinchorro mummy. The Chinchorro culture existed in southern Peru and northern Chile from 7020 to 1110 BC. As the photograph shows, the people of this culture had brown or chestnut European hair, and not stiff black Mongoloid Amerindian hair. In this post I said that I thought that the White Gods were the source of the Y haplogroup I2a1a1-M26 found in the Amerindians living in what were the high-culture areas of pre-Columbian America. I have also said that I think that Y hg I people originally had a cranial morphology like that of Cro-Magnon 1. 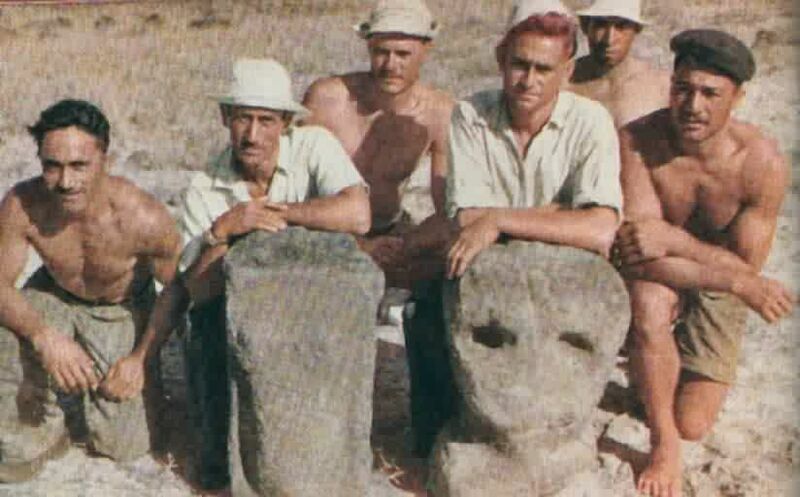 So it may be that the Easter Island skull in the photographs below belonged to an I2a1a1-M26 White God of Peru or Chile who made the journey across the Pacific to Easter Island. 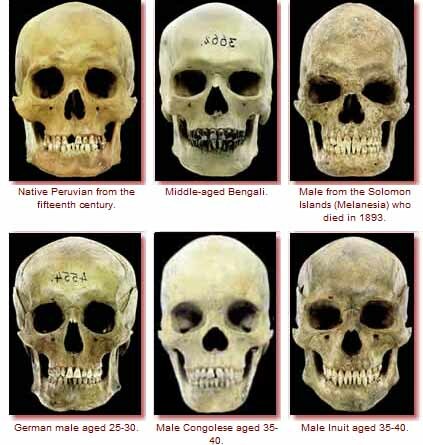 The next-to-last image below shows skulls from six different races. Note that the Easter Island skull looks nothing like the Melanesian skull from the Solomon Islands. 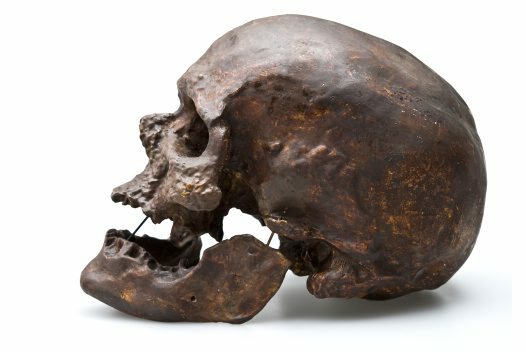 The Melanesian skull shares very primitive features with the Congolese skull, and such primitive features are completely absent in the Easter Island skull. 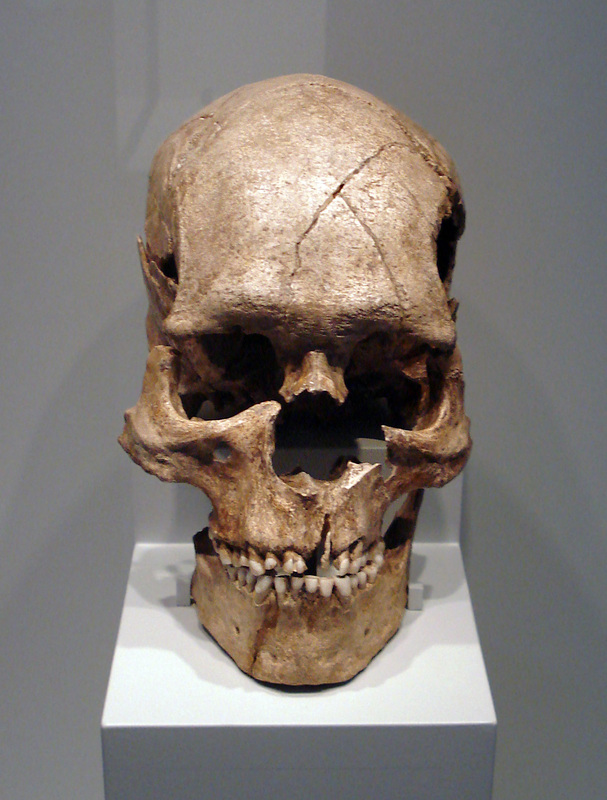 The Easter Island skull bears some resemblance to the 15th century Peruvian skull, although the resemblance is not nearly as strong as the resemblance to Cro-Magnon 1. The Peruvian skull appears to be the result of a hybridization between a Cro-Magnon-like European population and an Amerindian population. The 15th century in Peru was during the Inca period. According to the tradition of the Amerindians living on the island of Titicaca, the Incas were the product of matings between Amerindian women and the white and bearded men who originally inhabited the island. I’ll also point out here that my K = 5 and K = 6 admixture analyses of William W. Howells’ craniometric data identified the ancient Peruvian skulls in Howells’ dataset as Caucasoid. According to the traditional history of the Easter Island natives, there were two distinct races that inhabited the island. The first inhabitants were the Long-ears, or Hanau-epé, and it was they who had created the ahu, the moai, and the rongo-rongo writing system. Later the Short-ears, or Hanau-momoku came to the island, and they adopted the religion of the Long-ears and worked as laborers for them. At some point the Short-ears rose up against the Long-ears and, in an epic battle on the island’s Poike Peninsula, killed many of them. Different versions of the story give different numbers of Long-ear survivors. According to some versions, the Long-ears were completely exterminated. In other versions, there was only one Long-ear survivor, a man named Ororoine. In still other versions, the Long-ear women and children survived along with Ororoine. In 1862 Peruvian slave raiders struck Easter Island, and they captured around 1,500 of the natives, half of the island’s population. Among those captured, and who would later die, were the last king of Easter Island, Kaimakoi-iti, who was a direct descendant of Hotu Matua, the king’s sons and daughters, and almost all of the elite of the island, including the priests and the learned men who knew how to read and write rongo-rongo. After the natives were taken to Peru, international protests of their enslavement led to the Peruvian authorities ordering their return to Easter Island. By the time they were to be taken back in 1863, all but 100 of them had died from diseases. On the return voyage to the island, 85 of those 100 died from smallpox. The return of the remaining 15 then started a smallpox epidemic on the island, which further devastated the population. By 1877, after further epidemics, only 111 natives were still alive, and of those 111, only 36 had any offspring. The next year 20 Tahitians were brought in to help repopulate the island, and over the next decade much of the original Easter Island language and culture was either lost or significantly altered. The samples analyzed in the new paper from Willerslev came from 48 blood samples collected in 1971, which were the subject of this 2007 paper, and from 21 more blood samples collected in 2008, which were the subject of this 2008 paper. An overview of the HLA, mtDNA, and Y chromosome results from the 2007 and 2008 papers can be found in this 2012 paper, which is freely accessible. For the new paper, DNA was extracted from all of the 21 2008 samples and from 11 of the 48 1971 samples. Five of the 11 1971 samples were not used because of a low genotype call rate. Of the remaining 27 samples, eight unrelated samples were used in the analyses determining admixture proportions and admixture times. The investigated subjects were carefully selected with the aid of medical and historical records to exclude individuals of European admixture or from other Polynesian islands. Whenever doubt was raised concerning possible admixture, the individual was excluded, as previously described in detail. The genealogy of the individuals investigated was based on medical and historical records, supplemented with information from the selected individuals and others. The genealogy for the 48 1971 samples is below. The male at the very top of the genealogy, labeled PM, is Pakomio Maori. As the genealogy shows, he lived from 1816 to 1909. He was one of the 1,500 natives captured and taken to Peru in 1862, and he was one of the only 15 natives who survived and made it back to the island alive. The word maori in the Easter Island language referred to the learned men of the island, which suggests that Pakomio was one these learned men, and part of the island’s elite. Pakomio had blue eyes, red hair, white skin, and was very European-looking. Below is a photograph of Easter Islanders taken during the survey done by the USS Mohican in 1886. The man standing in front of the ahu with his hands clasped is Pakomio, who was estimated to be about 70 years old at the time. Note how most of the natives look like typical brown-skinned Taiwanese-Melanesian hybrids, while Pakomio has a much more European appearance. 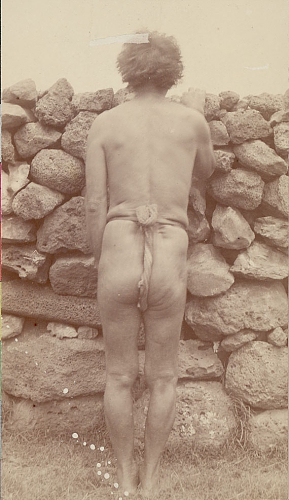 The next photograph, also from the Mohican survey, shows Pakomio from behind, wearing an ancient hami, or sacred loincloth worn by chiefs and priests. Note how white his skin is and how light his hair is. 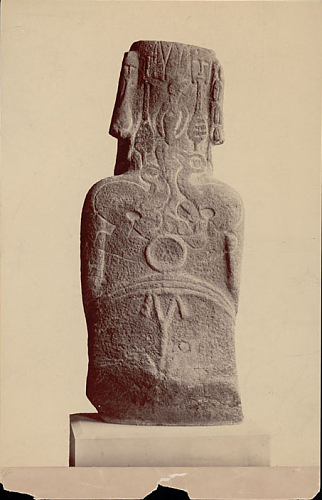 The hami was also carved on the backs of the moai, as shown in the photograph below. 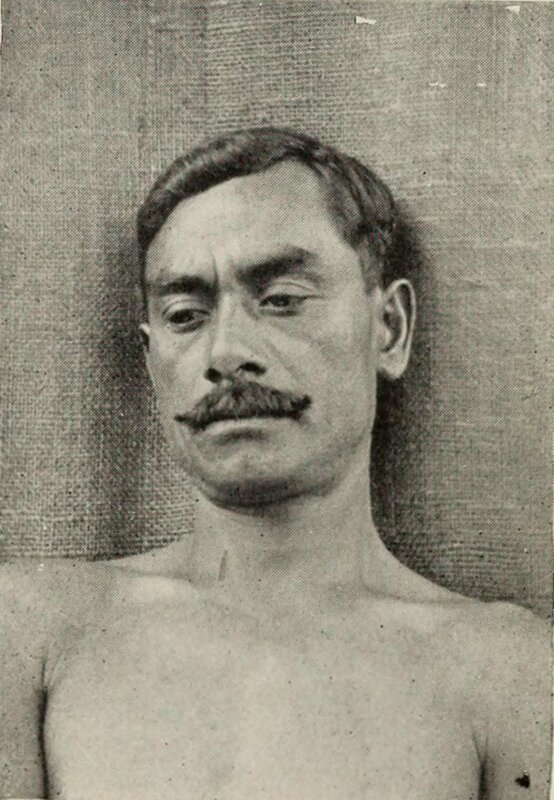 It can be deduced from the genealogy that Pakomio Maori was the source of the European HLA haplotype and the R1b Y-STR haplotype found in the 1971 samples. The frequency of the European HLA haplotype carried by Pakomio peaks in the Basque country of Spain and France at 125 people in every thousand. The haplotype quickly becomes less common beyond the Pyrenees, and in most of Europe other than France and Spain, there are no carriers at all. Most of the available information on Pakomio Maori comes from research done by Robert Langdon. Langdon believed that the presence of natives with European features on Easter Island, New Zealand, and other places in the Pacific was due to voyages made by the crew of the San Lesmes, a Spanish ship that disappeared in the Pacific in 1526 while trying to reach the East Indies. In the papers by Langdon here and here, he showed that it was extremely unlikely that the European HLA haplotype carried by Pakomio could have been introduced by any of the Europeans visiting Easter Island since 1722. In the first paper, he describes how he calculated the probability of the haplotype being introduced in post-Roggeveen times as being one in 3,550. One big problem with Langdon’s theory, however, is that the blue eyes and red hair possessed by Pakomio are not at all typical of Basques or Spaniards, who usually have brown eyes and brown or black hair. Another big problem with his theory is that no one ever observed any traces of Basque or Spanish language or culture among the natives of Easter Island. If any such traces had ever existed, they certainly would have been noticed by the Spaniards who visited the island in 1770. Peter Marsh did a good job of pointing out the many absurdities of Langdon’s theory on his page here. Langdon deserves credit for the many important pieces of information turned up by his research, but the theory he created to explain all of that information is totally wrong. The correct explanation for the presence of the European HLA haplotype in Pakomio and his descendants is that Pakomio, as a member of the island’s elite, was a descendant of the White Gods of Peru who were the island’s first inhabitants, and who were the creators of the island’s civilization. The White Gods, in turn, must have crossed the Atlantic to South America during a time when Pakomio’s HLA haplotype was found in Southwestern Europe in conjunction with Pakomio’s blue-eyed and red-haired phenotype. At some time later the Southwestern European populations carrying the haplotype must have lost the associated phenotype as a result of admixture from Europe’s first farmers, who typically had dark hair and dark eyes, as opposed to the light hair and light eyes that must have been present in at least some of the hunter-gatherers of Upper Paleolithic and Mesolithic Southwestern Europe. As the genealogy shows, Pakomio was married twice. The name of his first wife was Te Rive Meitota, and they had a daughter before the Peruvian slave raids named Eritapeta, or Rita for short. She didn’t have her father’s light skin, but she did have freckles, like most of the members of her family. 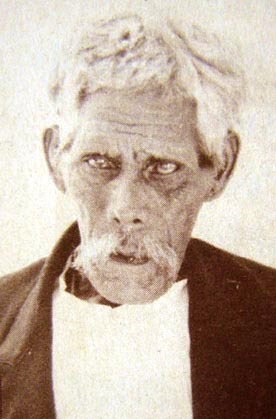 Pakomio married his second wife, Angata, after the slave raids. Angata had dark skin, brown eyes, and black hair. As the 2012 review paper notes, she likely carried an Amerindian HLA haplotype and a Taiwanese-Melanesian HLA haplotype. Below is a photograph of Angata taken during the 1914 expedition to Easter Island conducted by Katherine Routledge. 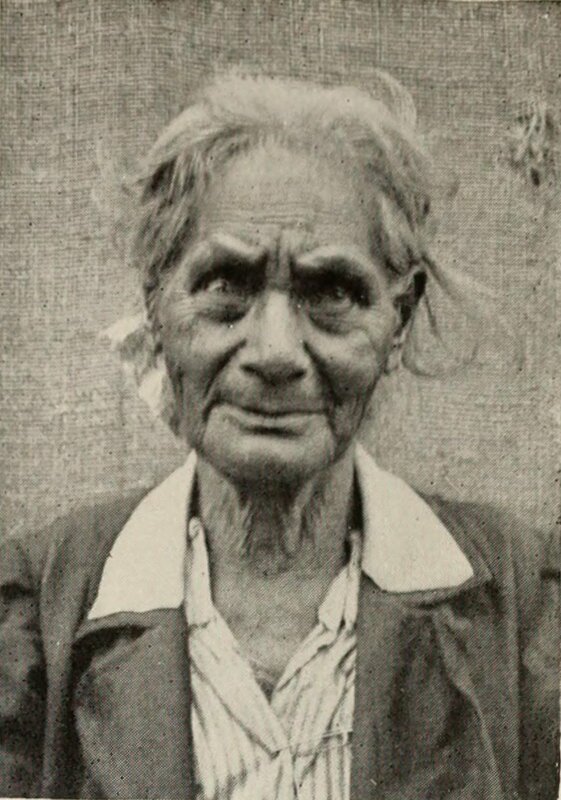 According to the 2012 paper, Angata was born in 1846, so she would have been 68 in this photograph. She died one year later, in 1915. According to the page here, the woman in the hat in the photograph below taken during the 1886 Mohican survey is probably Angata. She would have been 40 years old at the time. Pakomio and Angata had five daughters and one son together. Their son, Nicolas Pakomio, is individual no. 1 in the genealogy. He had brown eyes, and as the photographs of him below show, he was very European-looking. The third photograph was taken during the visit of the Canadian Medical Expedition to Easter Island in 1964–65, when he was about 67 years old. Note in particular how extremely high his forehead is, and how long his face and chin are. 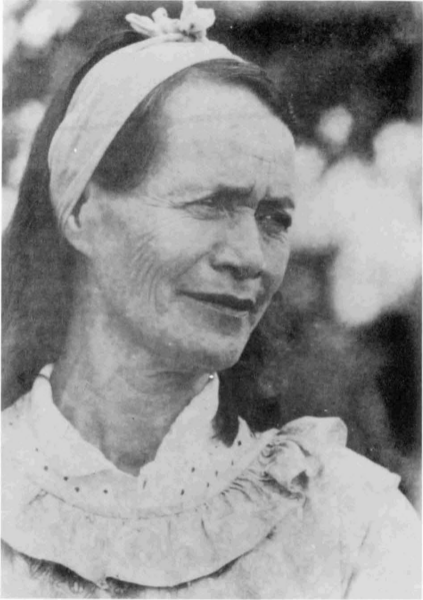 Pakomio’s second daughter with Angata was Maria Renga, known later as Hilaria. She had bluish eyes, reddish hair, and white skin. 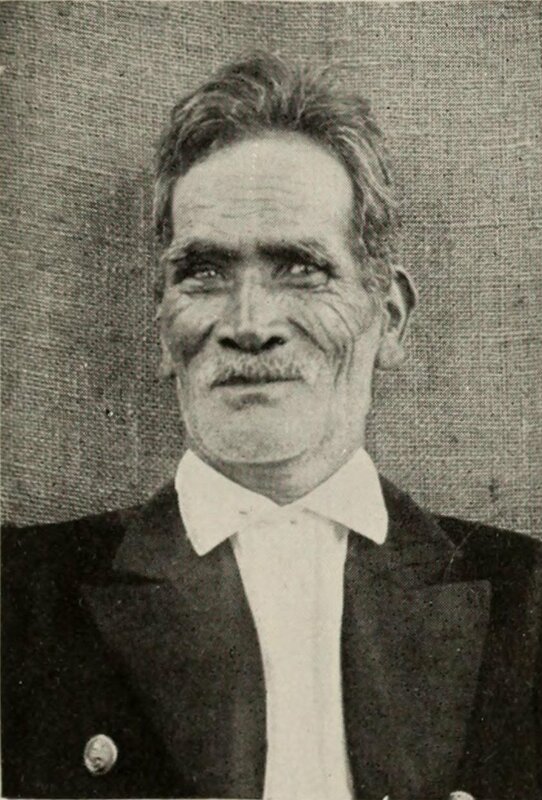 Hilaria’s husband was José Atan Aharekaihiva, who was the son of Atamu Tekena. After the death of the last true king of Easter Island and his son during the Peruvian slave raids, the island was without a king for two decades. 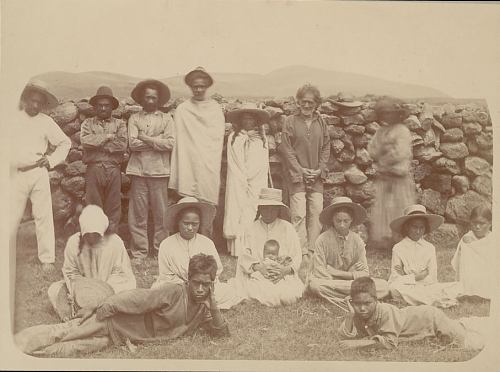 Then in 1883, the Bishop of Tahiti appointed Atamu Tekena “king” in order to protect church interests from Maison Brander, a company which was then using most of the island as a sheep ranch. It was Tekena who in 1888 signed the treaty authorizing the annexation of the island by Chile. Although Tekena was not descended from any of the previous true kings of the island, he did belong to the Miru clan, which was the ruling, high-status clan among the eight main clans on the island. All of the true kings of the island specifically belonged to the Honga, which was a lineage within the Miru clan that was directly descended from Hotu Matua. Below is a bust of Atamu Tekena. Note that he had very European features, including a beard. 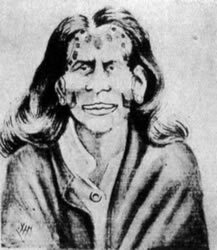 Below are drawings of Ana Eva Hei, the wife of Atamu Tekena. She was tattooed, and she also looked more European than Taiwanese-Melanesian. 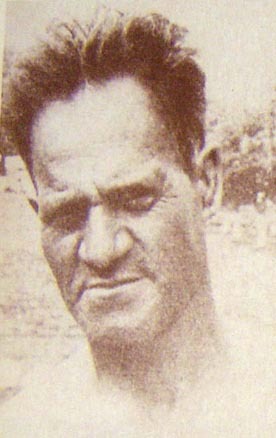 The eldest son of Hilaria and José Atan was Pedro Atan Pakomio, who was the mayor of Easter Island at the time of the 1955–56 expedition led by Heyerdahl. Another important person on the island at that time was Sebastian Englert, a Catholic priest who lived there from 1935 to just before his death in 1969. Englert had compiled genealogies of the Easter Islanders, and he told Heyerdahl that Pedro Atan and his three brothers Juan Atan, Estevan Atan, and Atan Atan were the only direct paternal descendants of Ororoine, the only Long-ear man said to have survived the massacre of his people. 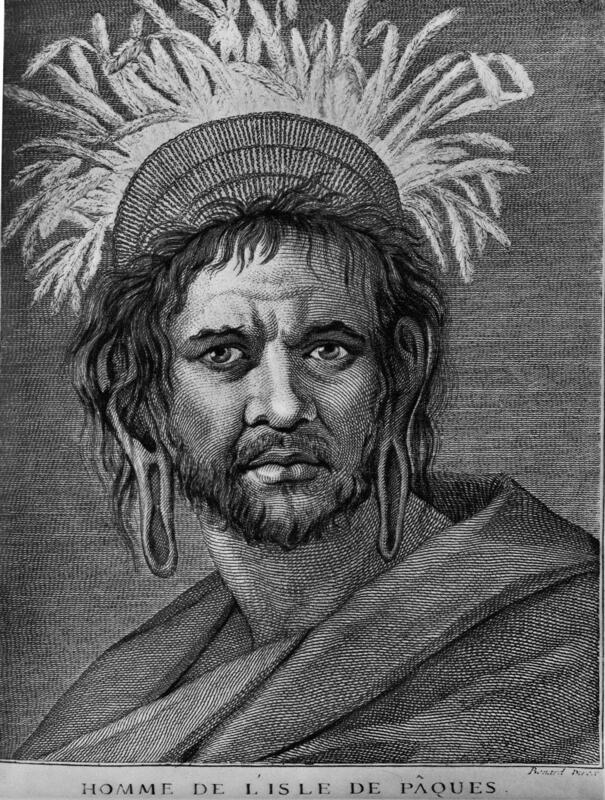 The four Atan brothers looked nothing like Taiwanese-Melanesian hybrids, but instead looked like Europeans. One of Pedro’s daughters had “milk-white skin and completely red hair”, and Pedro’s son, who was also named Juan, also had red hair. Pedro’s grandson Salvador Atan was born while Heyerdahl was on the island, and he too had red hair. 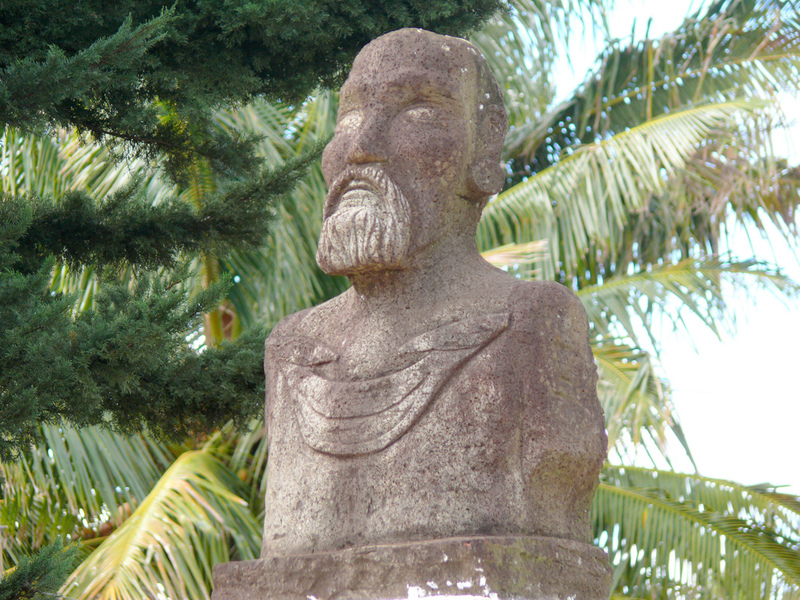 During the expedition, Heyerdahl sought to learn how the moai were carved, transported, and erected, and the only one of the natives who possessed the knowledge of how to do these things was Pedro Atan, who said that the knowledge had been passed down to him by his father and grandfather. There were other natives who were said to be descended from Long-ears on their mother’s side, and they were the ones who assisted the Atan brothers when they demonstrated for Heyerdahl how the moai were carved and erected. Below is a photograph of, from left to right, Atan Atan, the mayor Pedro Atan, Hei, Pedro’s red-haired son Juan, Lazarus, and Enlique. Hei, Lazarus, and Enlique were some of the natives said to be descended from Long-ears on their mother’s side. 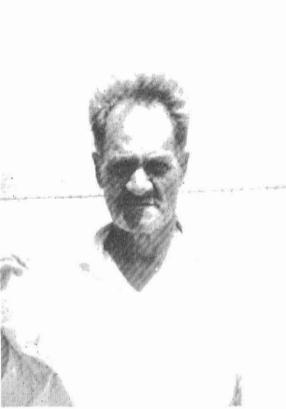 It’s possible that individuals 92 and 93 in the genealogy are Hilaria and José Atan, and that 41, 42, and 43 are three of the four Atan brothers. But two of Pakomio’s five daughters with Angata are not included in the genealogy, so 92 might not be Hilaria. Below is a photograph of Maria Gracia Pate Pakomio, one of Pakomio’s granddaughters. Remember that this very European-looking woman, like all of the other natives shown in this post, was a pure-blooded Easter Island native. 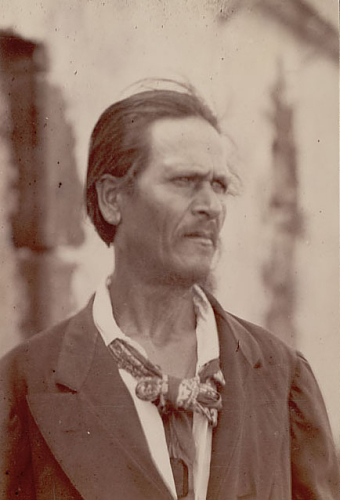 The next photograph is of Juan Tepano (1872–1947), a pure-blooded native living on the island during the 1914 Routledge expedition. 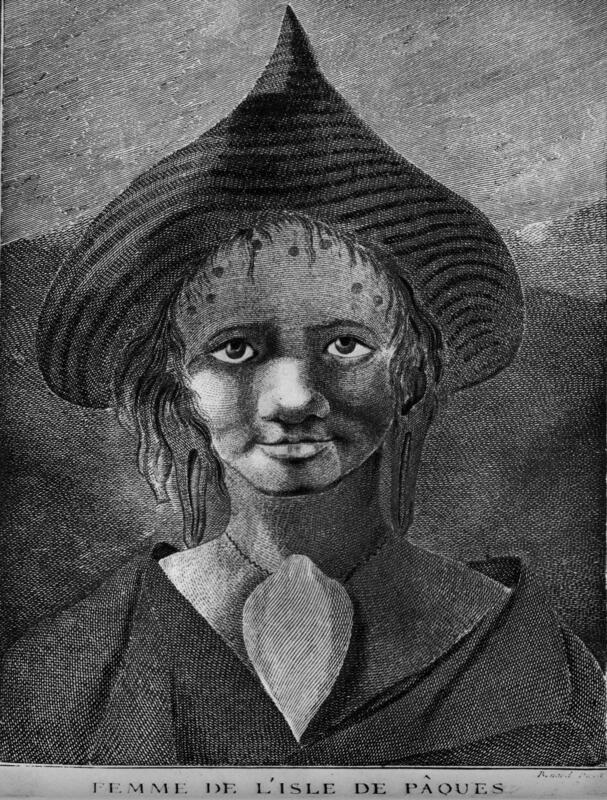 As the photograph shows, he had brown skin, but very European facial features. Below is Juan Tepano’s mother Viriamo, who was also very European-looking. 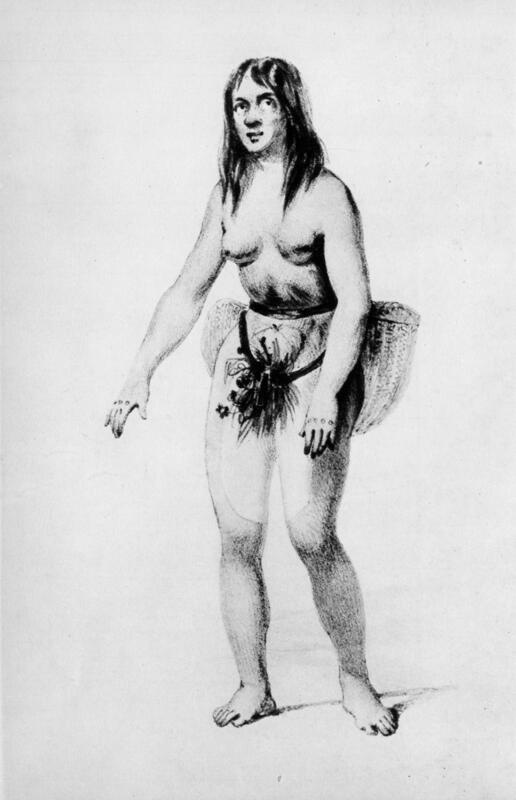 Viriamo was born around 1839, and she was the oldest native woman living on the island during the Routledge expedition. 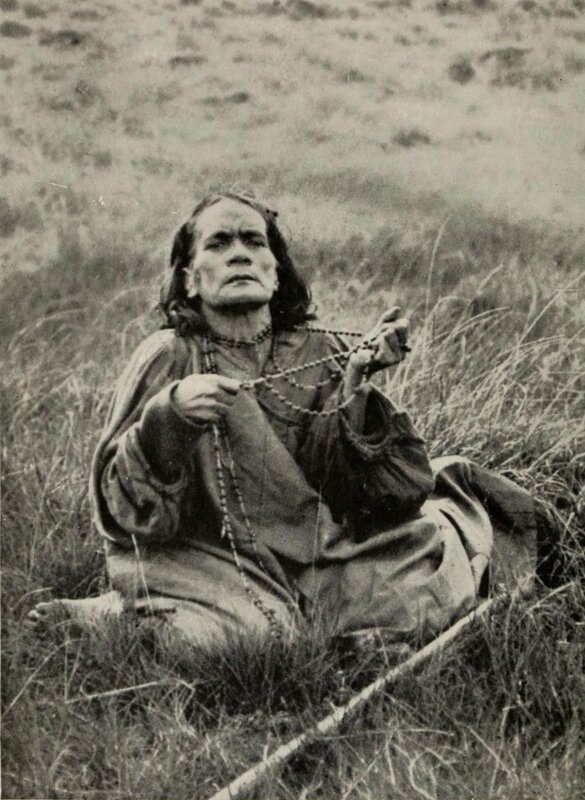 By 1911 only four islanders out of 228 wore traditional tattoos, and they were all women. By 1930, only two of these four women were still alive: Atamu Tekena’s wife Ana Eva Hei, shown above, and Viriamo. Below are drawings made in 1911 that show Viriamo’s tattoos. 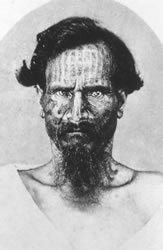 Next is a photograph of a tattooed Easter Island nobleman taken in the 1870s, and two drawings of the same nobleman made in the 1880s. The name of this nobleman was Tepano. I assume that he was the father of Juan Tepano, but I have not been able to confirm that. As you can see, he was extremely European-looking. Note that he had a beard, and also note that he had a very high forehead, like Nicolas Pakomio. 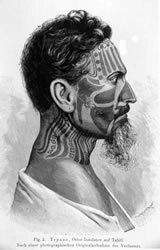 The next drawing is of a tattooed Easter Island native chief made during the 1872 expedition led by François-Théodore de Lapelin. This man looks no different than many European men. Note that he had a full beard. Below is a photograph of Te Haha, who was another Easter Island native living during the 1914 Routledge expedition. He was a nobleman of the elite Miru clan, and he was an attendant of Nga-ara, the next-to-last true king of Easter Island and the last master of rongo-rongo. He was obviously very European-looking. Note that, like Nicolas Pakomio and Tepano, he had a very high forehead, and note that like Nicolas Pakomio he had a long face and chin. The next photograph is of the Easter Island sage Kamake-a-Ituragi. He was very European-looking, and note that he had a long, narrow face and a long chin. Finally, below is a photograph of the Easter Island native Kaitae taken during the 1886 Mohican survey. Kaitae was then the nearest descendant of the last true king of Easter Island. He was estimated to be about 80 years old at the time. Recall that Kaitae was the elder who, when showed the rongo-rongo tablets, recited exactly the same texts as those given by Ure Vaeiko. 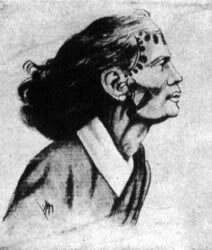 The photograph shows that Kaitae was extremely European-looking, and it shows that like many of the other elite, European-looking natives, he had a very high forehead, a long face, and a long chin. We can see in the moai the same physical features seen in the above elite, European-looking natives. Like those natives, the moai had long faces. The moai also had long chins. Heyerdahl noted that “whereas on an ordinary face the distance from mouth to chin is normally twice the distance from mouth to nose, on the Easter Island statues it is three times that distance”. He thought that the reason for this was that a third of the chin was actually intended to represent a beard. 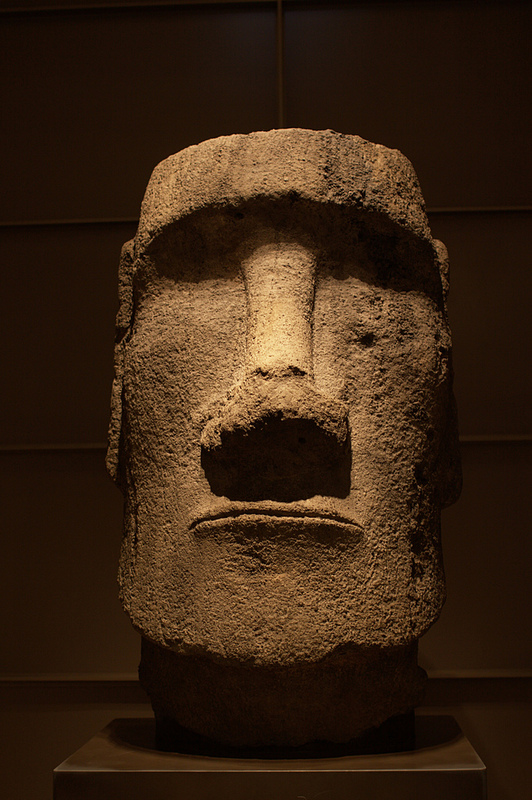 As the photograph below shows, the moai definitely did have beards, which project outward from the surface of the neck. But the photograph also shows that the growth of the beards is not sufficient to account for the length of the chins. The long chins were rather an accurate representation of a distinctive physical feature of the White elite of Easter Island. Note also that the heads of the moai are truncated and flattened just above the ears so that the red pukao could be placed on top. 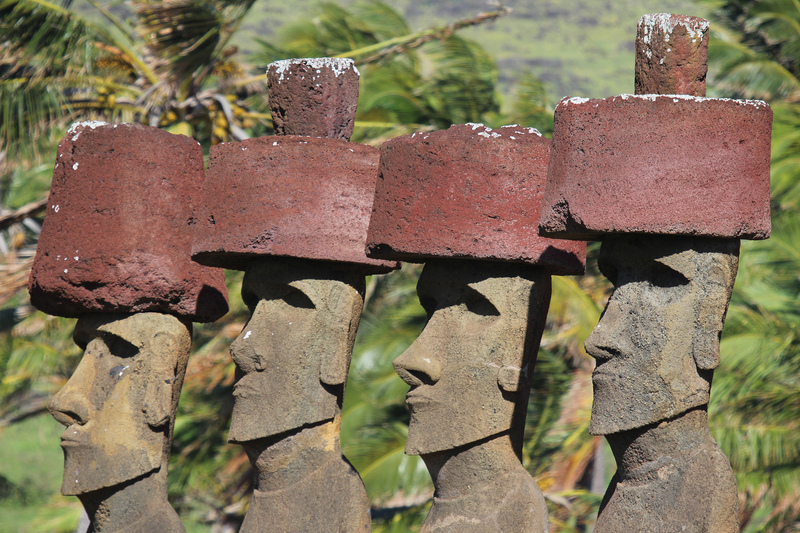 The topknots must have represented not only the red hair of the kings of Easter Island, but also the extremely high foreheads so common among the elite. The long, narrow faces and long chins of the White elite can also be seen in the small wooden figures found on Easter Island called moai kavakava, shown below. Note that, like the moai, these figures have long ears. The very high forehead, very long and narrow face, and very long chin of the White elite of Easter Island make up an extreme phenotype that is either very rare or completely absent in White people today. 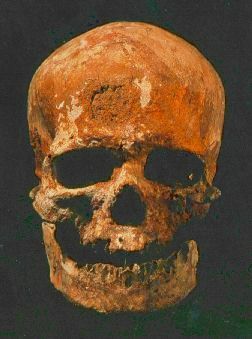 But this exact phenotype is seen in the Combe-Capelle skull, which was found in southwestern France, and which has been dated to 7575 BC. 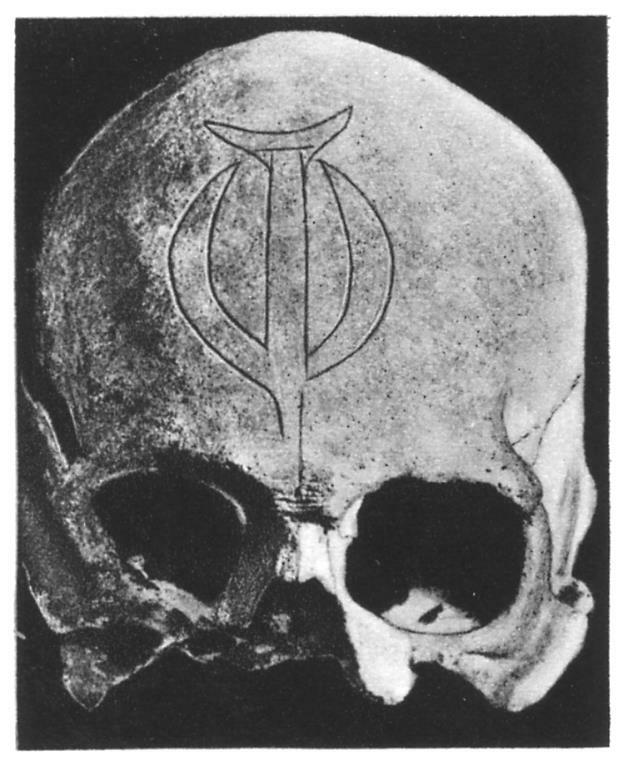 A photograph of the skull is below. The skull is similar to other skulls that have been found in Italy, the Czech Republic, and Russia. These other skulls are dated to between 30,000 and 20,000 years ago, and they are all associated with the Gravettian culture. I have said before that I think that Y hg R people originally had a cranial morphology like that of these skulls, and I have also said that I think that the Gravettians belonged to Y hg R. The reality of these associations is strongly confirmed by the fact that on Easter Island we find someone like Nicolas Pakomio, who had a cranial morphology exactly like that of Combe-Capelle, and who also belonged, like his father Pakomio Maori, to Y hg R1b. It also makes sense that we find in Nicolas and his father an HLA haplotype whose frequency peaks in the Basque country, because the Combe-Capelle skull was found not too far from the Basque country, in southwestern France. On Easter Island the combination of physical features making up the Combe-Capelle phenotype was preserved until modern times, while in Europe the association between the individual features has long since been broken down by intermixture between different groups. Note that if the Combe-Capelle man belonged to Y hg R1b, as I believe he did, then the Kurgan hypothesis must be false. Y hg R1b is associated with the centum Indo-European languages, and the presence of people speaking a language ancestral to those languages in France during the Mesolithic completely contradicts the Kurgan hypothesis, which claims that Indo-European languages didn’t spread to Western Europe until the Bronze Age, or even the Iron Age. The investigated individuals were carefully selected to be of Easter Island origin for many generations by information from several persons well informed about the genealogy of early families of the island and from written sources. Furthermore, all investigated individuals were asked about their ancestors as far back as their great-grandparents. All had at least several grandparents and great-grandparents who were probably of Easter Island descent or where no foreign admixture was known, but some also had grandparents or great-grandparents of European descent. So it is known that the 2008 samples had admixture from modern Europeans that was introduced just two or three generations before the 2008 individuals were born. The eight unrelated samples used for the analyses in Willerslev’s paper were drawn from a set of 27 samples. Of those 27, 21 were from the set of 2008 samples, most of which were unrelated, while six were from the set of 1971 samples, most of which were related. The eight analyzed samples weren’t drawn from the set of 27 randomly, because of the requirement that they be unrelated, but if they had been, it would be expected that six of the eight were from the 2008 samples, while two were from the 1971 samples. The requirement that the samples be unrelated would make the expected number of 1971 samples even less than two. So the admixture proportions and admixture times determined by the analyses in Willerslev’s paper are much more likely to pertain to the recent European admixture in the 2008 samples than to the European admixture in the 1971 samples, which is from the original White inhabitants of Easter Island. The ADMIXTURE analyses in figure S1b of the freely accessible supplemental information for Willerslev’s paper show that two of the eight samples had about 50% European admixture, two had about 25%, two had about 12.5%, and two had none. 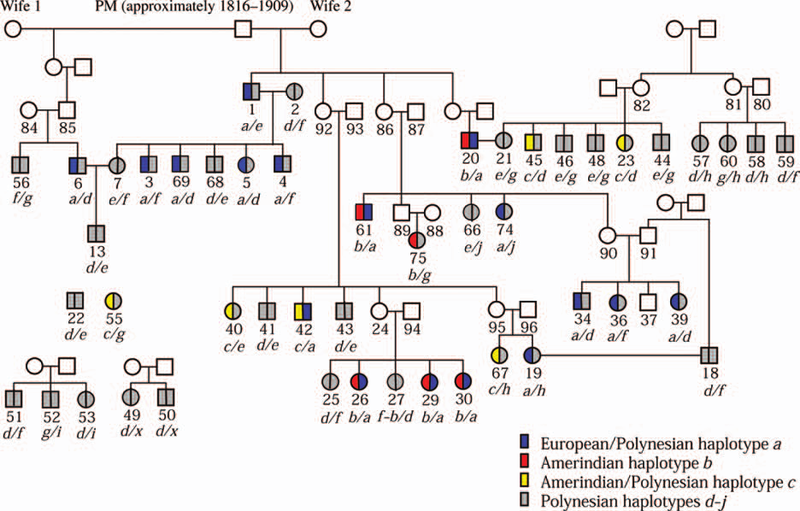 50% European admixture is what would be expected for someone with two European grandparents. 25% would be expected for someone with one European grandparent. And 12.5% would be expected for someone with one European great-grandparent. So the European admixture proportions seen in the samples are what would be expected if the six admixed samples came from the set of 2008 samples, which are known to have come from individuals who had grandparents or great-grandparents of European descent. The European HLA haplotype that was carried by Pakomio Maori and passed down to his descendants was actually part of a larger European/Taiwanese-Melanesian recombinant haplotype. One of the Amerindian HLA haplotypes found in the 1971 samples was also part of a larger Amerindian/Taiwanese-Melanesian recombinant haplotype. The 2007 paper noted in reference to the recombinant Amerindian haplotype that the recombination rate between the two parts of the haplotype was only 0.0094, which implied that the Amerindian haplotype must have entered Easter Island early. But that same low recombination rate applies just as well to the recombinant European haplotype, which means that the European haplotype also must have entered Easter Island early. The 2007 paper also noted that the recombinant Amerindian haplotype was present in different and autonomous lineages of the 1971 individuals, which was more evidence that the Amerindian haplotype must have been introduced to Easter Island early. 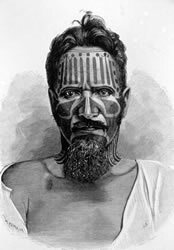 The only 1971 individuals who had the recombinant European haplotype were those who were descended from Pakomio Maori. The 2008 paper found that four of the 2008 individuals had the same recombinant European haplotype carried by Pakomio Maori. Two of those four individuals were related to the 1971 individuals, but two were not. So the recombinant European haplotype was also present in different and autonomous lineages on Easter Island, which is more evidence that the European haplotype was introduced early. Willerslev’s paper says that further work is needed to determine which Amerindian populations the Amerindian admixture in Easter Islanders is from, but the 2012 review paper makes it clear that the Amerindian HLA alleles found on Easter Island are from South America. The 2012 paper also notes that two of the Amerindian HLA haplotypes found on Easter Island are similar to haplotypes found only in the Aymara Indians who live around Lake Titicaca. I think that the White Gods of Peru brought some Amerindians to Easter Island to work as laborers. I think that these Amerindian laborers mixed with the Taiwanese-Melanesian laborers on the island sometime between 1280 and 1495. This estimated time of admixture may correspond to the arrival of the Amerindians on the island, or it may correspond to the arrival of the Taiwanese-Melanesian hybrids. I think that the White elite of the island kept themselves separate from the laborers for a long time, and married only within their race. But I think that at some point there was a breakdown in the social order, and the Whites then started mixing with those that they once ruled over. This breakdown may have followed the massacre of the Long-ears by the Short-ears, which was believed by Englert and Heyerdahl to have taken place around 1680. Or it may have followed the arrival of modern Europeans on the island starting in 1722. Some catastrophe appears to have occurred on the island between the 1770 visit by the Spanish and Cook’s visit in 1774. The condition of the natives as described by the English was much worse than what was described by the Dutch and the Spanish. And whereas the Dutch and the Spanish had only seen standing moai, the English reported that many of the moai were toppled, and that the ahu on which they stood were damaged. Willerslev’s paper mentions the possibility of analyzing ancient DNA from Easter Island in the future. You can bet, with anti-White propagandists like Eske Willerslev in charge of things, that DNA from the ancient Caucasoid skulls on Easter Island will never be analyzed, or that it will analyzed and that the results will never be made public. There’s no way that the archeologists who work with the mummified remains of the elite of ancient Peru cannot know that those remains are the remains of White people. There is an obvious conspiracy being perpetrated by the fraudulent “scientific community” to ensure that the role played by White people in the ancient history of the Americas and Polynesia does not become widely known. The effect of this fraud on the part of Willerslev and those like him is that the credit for the ancient civilizations of the Americas and Polynesia is not being given to those who deserve it, but instead to others. It’s not surprising to see such a reprehensible act being committed by Willerslev, because in this paper from November 2013 Willerslev took credit for “revealing” that Amerindians are Mongoloid-Caucasoid hybrids, something that I deserve the credit for, because I had been revealing that fact over the preceding eight months. The rotten, loathsome elite of White countries, which is especially powerful in the academic institutions of those countries, will pull out all the stops in order to prevent the presence of White people in the ancient Americas from becoming widely known. They know that if it were to become widely known, then it would also become widely known that the legends about civilization-creating White Gods were true. They cannot allow this, because it would shatter their lie that there are no differences between the races in their ability to create and to maintain civilization. They don’t want average White people to understand that as they continue to allow White countries to be flooded by non-White immigrants, their standard of living will continue to decline, they will increasingly be the victims of criminal violence, their societies and communities will continue to dissolve, and their civilization will continue to crumble. They don’t want it to be understood that, if things keep going in the direction they’re going now, the fate that ultimately awaits Whites in their own countries is the same fate that befell the white and bearded men on the island of Titicaca, and the Long-ears on Easter Island. Aku-Aku can be read online here. Heyerdahl’s 1950 book on the Kon-Tiki expedition can be found here. 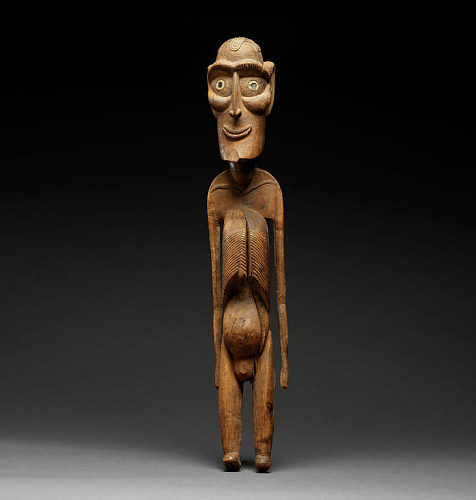 Torrent files for Heyerdahl’s 1975 book The Art of Easter Island can be found here. I have only just chanced upon the authors’ several articles on this issue. As a firm believer in Heyerdahl’s work on Pacific migrations I had given up hope of his work ever being generally accepted. Even Wikipedia is misleading. I have all Heyerdahl’s books and published articles and have corresponded with Thor. Several emails to Heyerdahl museum set up in his native country and to his son were never answered. Unfortunately he failed to make it quite clear in his interviews (and sometimes in his writings) that he was talking about two quite different migrations into the South Pacific and from different directions, so one could see how most assumed he was saying the Polynesians (which most believe to be the first inhabitants of the South Pacific), originated from South America whereas Thor actually believed the Polynesians originated from Taiwan/SE Asia. The aboriginal people of Taiwan, today, say they spread into the Pacific as far as Easter Island. Thor wrote to me saying he had told people “a thousand times” he was not proposing a South American origin for the Polynesians, but he failed to get his message across. Academics were his worst enemies. Personally, I feel evidence suggests an Iberian origin for the White Gods of Peru.